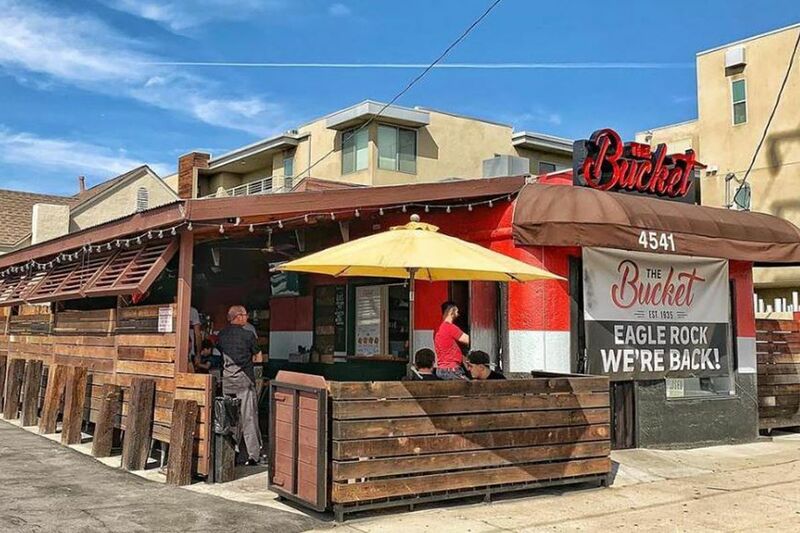 Anyone who went to Occidental College or lives in Eagle Rock has probably passed by The Bucket, a 78-year-old standalone burger restaurant along Eagle Rock Boulevard that was most recently called The Patio. After The Patio closed some time in August, someone else took over ownership of The Bucket, though calls to the restaurant have led to zero information. Despite the fruitlessness of trying to find out who reopened The Bucket, the burger hangout is back as of October 28 after losing its lease in 2013. The last owner was George Eckley, though he himself acquired the restaurant from other folks, who must’ve gone through multiple generations in order to trace its history back to 1935. It’s a bit murky and quality went through peaks and valleys over the years, but it’s rumored that former President Barack Obama visited when he was briefly a student at Occidental College. What to expect on the menu? So far there seems to be some Instagram-friendly greasy bites like multiple kinds of loaded fries; burgers stuffed with bacon, cheese, double patties, fried eggs, and even fries; chicken and carne asada tortas; and craft beer. There’s still a covered patio with televisions, making it a prime place to watch sports, though any Saturday or Sunday football fans will have to wait until they expand hours. Right now, The Bucket is only open from Monday to Friday from 9 a.m. to 9 p.m. The Bucket. 4541 Eagle Rock Boulevard, Los Angeles, CA 90041.